Free Shipping Included! Kurt Adler Hollywood Night Stars Nutcracker, 19-Inch by Kurt Adler at Two Clock. MPN: HA0179. Hurry! Limited time offer. Offer valid only while supplies last. Designed by renowned artist Holly Adler, Hollywood Nutcrackers are a whimsical collection of nutcrackers created exclusively for Kurt S. Adler, Inc. Designed by renowned artist Holly Adler, Hollywood Nutcrackers are a whimsical collection of nutcrackers created exclusively for Kurt S. Adler, Inc. and features a variety of designs including Christmas, fantasy and everyday nutcrackers. 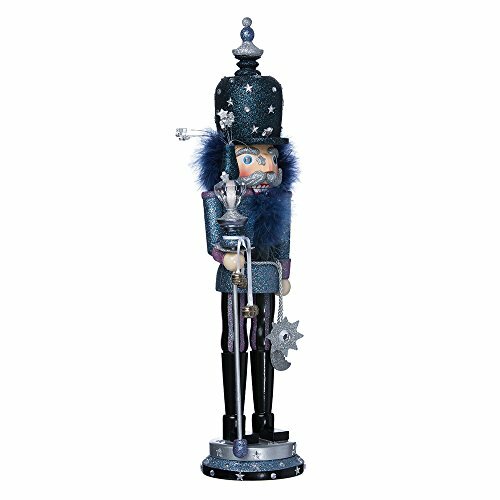 This 19" Hollywood Nutcracker by Kurt Adler features a guard nutcracker dressed in navy blue attire with a navy hat embellished with silver stars. Around his waist hangs a cutout of a silver star and moon and he holds a blue and silver staff. This Hollywood Nutcracker is here to protect and serve you while the stars remain in the night sky.